I did end up sewing all day the Saturday before Easter. 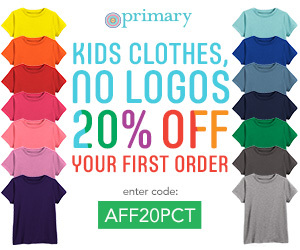 Easter Sunday is the one Sunday each year that I try to have my kids wearing something fresh and new for Mass. 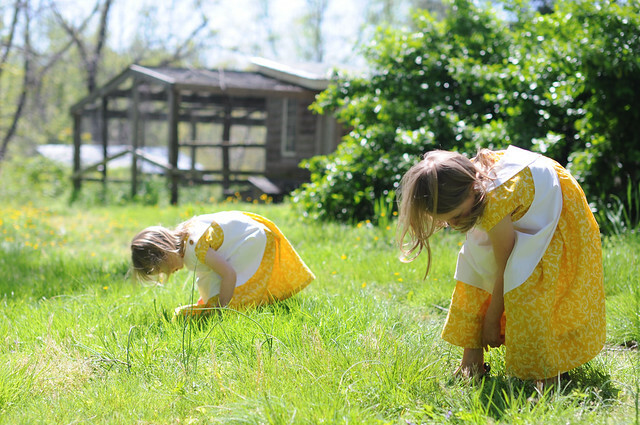 My girls have been asking for Emily dresses for quite some time now, and I thought they could work as Easter dresses as well. 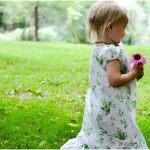 If you don’t have the book Emily and Daisy , you may not know what an Emily dress is. My girls really love that book! 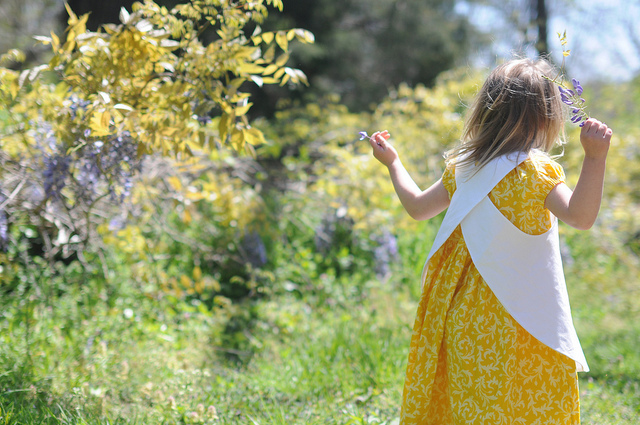 I sewed an Emily dress for Larkspur a couple of years ago, but it is too small for her now, and so stained that I couldn’t even really hand it down to Beatrix. 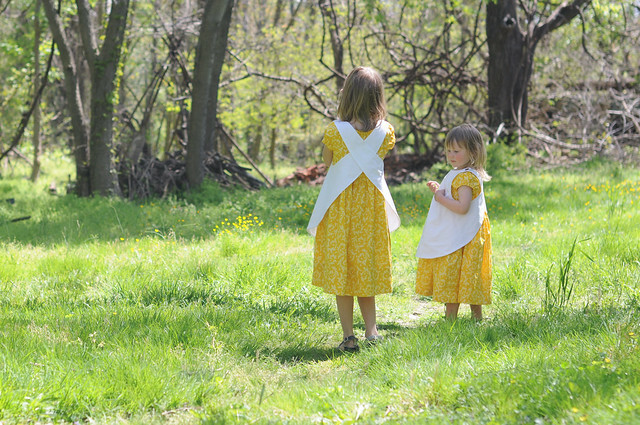 This time around I used the same pattern that I used for last year’s Easter dresses, but added a pinafore rather than a sash and apron. 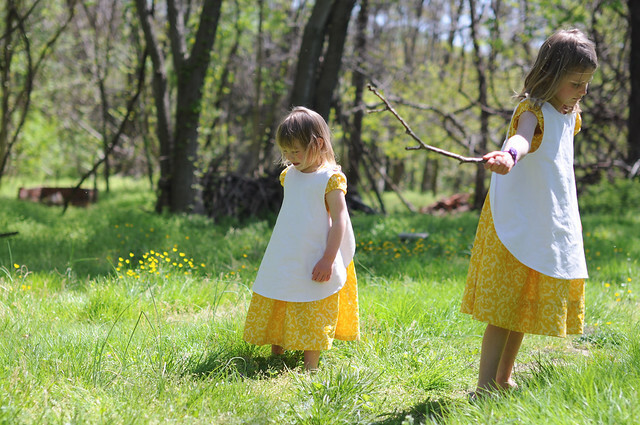 These dresses aren’t as exact a replica as the one I made last time, but I like them better and the girls are perfectly happy. I am really into those pinafores. I may have to sew some more. 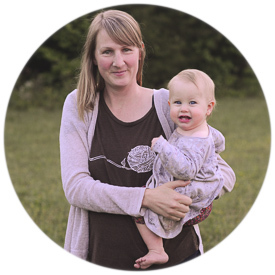 And speaking of sewing, my friend Elizabeth has started a Thursday link up called Needle and ThREAD. 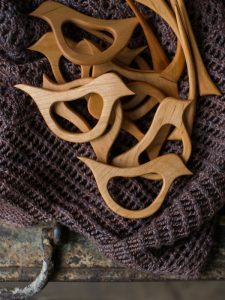 It is similar to the Yarn Along, in that you share something you are creating along with what you are reading. The difference is that Needle and Thread is for sharing sewing projects (or any project that involves “pulling a needle through cloth.”) So for those of you who sew, go check it out and consider joining Elizabeth on Thursdays! simply stunning, both – girls and dresses! Oh Ginny, the dresses are lovely and so beautiful. And of course your photography has captured such wonderful moments. 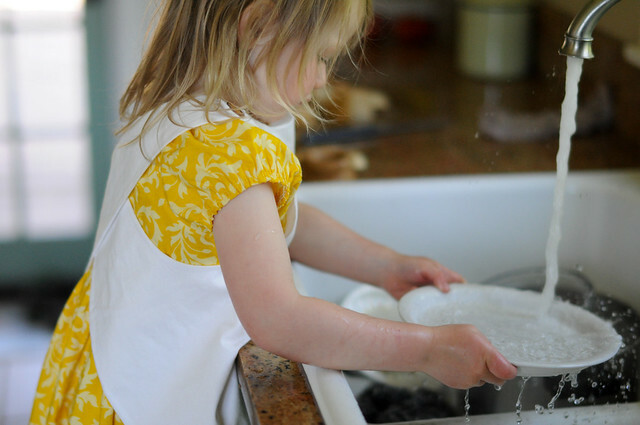 Hope that pinafore is still very clean! Such beautiful girls and dresses. Do you by any chance still have the pattern for the pinafore dress you made two years ago. I am loving the shape of that one. 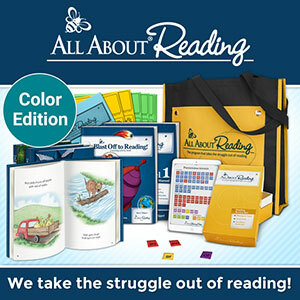 I wish I could, but I drew that one up myself based on the illustrations in the Emily and Daisy book. Dear Ginny, your girls are adorable! Especially in these wonderful dresses! I thought I had no idea who Emily and Daisy are, turned up to be a book of my favourite childrens book writer – Elsa Beskow. Yes I am swedish and I grew up having her books beeing read to me and so have I also read them for my children. Our absolute favourite is “The Sun Egg” please read it for your little girls (and boys) it is such a lovely story. Love, love, LOVE the yellow! The dresses turned out beautifully! I absolutely love the yellow! 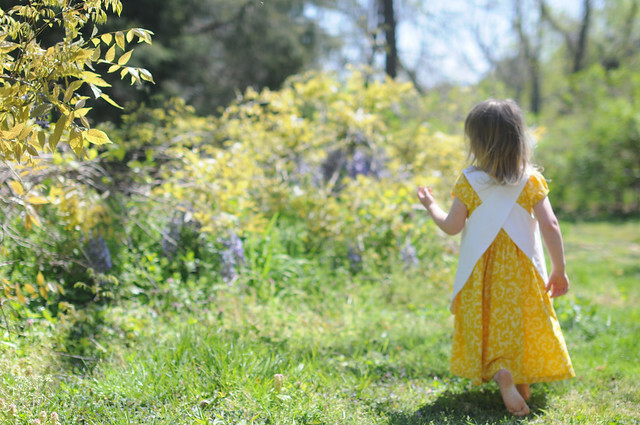 What I love most of all, though is that Larkspur’s first Emily dress is too well-loved to be passed down – how often do we save the “good stuff” so it doesn’t get dirty, instead of using and enjoying it! What happy girls in beautiful dresses. I always feel so peaceful and happy after viewing your posts. Darling! They will love having the photos you’ve taken when they get older. I love seeing pictures of when my sister and I were dressed alike on those special occasions. Terrific photos – terrific dresses. The yellow fabric is beautiful! Lovely, lovely dresses. It makes me smile so much that your daughters so consistently seem to request clothes inspired by the stories they read. Adorable dresses Ginny! Love them! I bought that pattern a long while ago after seeing you mention it and 3 of my girls each have 2 dresses from it. Love it! 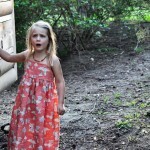 You should check out my blog because we did a “Little House on the Prairie” birthday with dresses to go with it! It would be right up your alley! 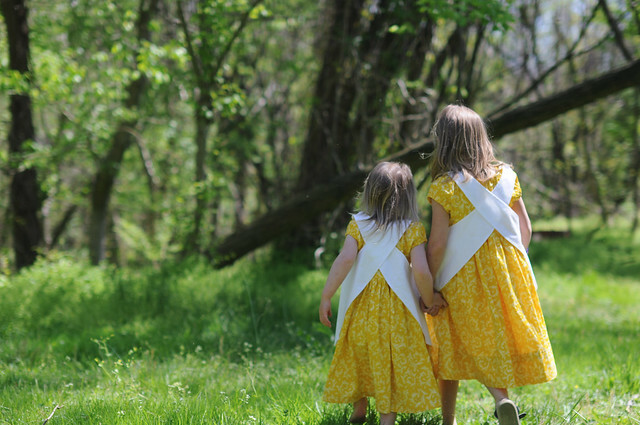 Your girls look so beautiful in those sunny dresses! Your girls are so lovely. Those dresses are adorable, and I’m guessing the pinafores arent attached so they can be removed/changed as necessary? My mum and her sisters dressed all of us in pinafores, it was a very practical and cute way of keeping our nice clothes clean without making us stay inside. Then they’d whip the pinny off and ta-da, 5 little girls in perfect church clothes. Love. Them. And I’m totally digging those pinafores as well. Precious. Good job, momma! Such a lovely colour, perfect for Easter. those dresses are so sweet. wow. i must learn to sew and get a sewing machine i can use. it makes me want to sew all of little fiona’s clothing! Thanks a lot for sharing the link, I was actually asking myself if someone else had done some kind of a sew along. Since my #6 was born (a girl!) (just a month ago) I’ve really been wanting to make some clothes!!! 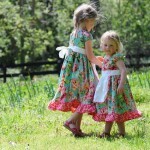 Love these dresses and the aprons! Adorable! Love the dresses, they turn out really well. So sweet!! And so lovely!!! Dear Ginny…So sweet. 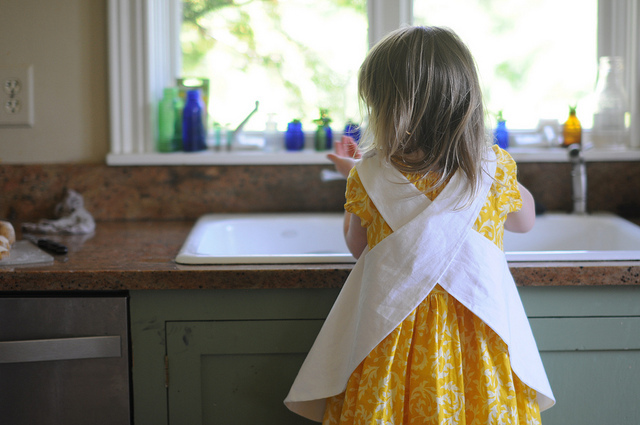 There is something so timeless about a little girl in a pinafore. I have wanted to make such a dress for my 3 year old, but I’m in the middle of other sewing for her. I have made such pinafores in a shorter version as bibs for my baby son and a little winter warm top for my daughter. Simply cute! And those two sisters…ah, how lucky to have a sister! Dear Ginny, I also forgot to tell you that Emily and Daisy is one of Sunshine’s favourite books. I came back for another peek at those sweet dresses. I most definately love them! 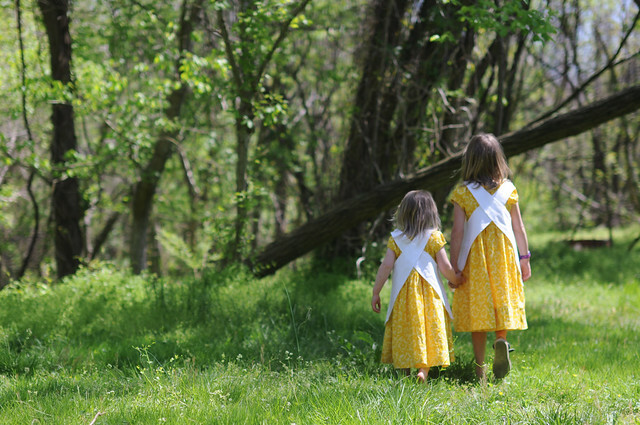 What beautiful Easter dresses….simply stunning! Oh my goodness!!!! Their dresses are beautiful! And I love the pinafore- actually, I would love to have one of those to wear, maybe with some big pockets sewn on the front? Hmmmmmm……. how adorable. 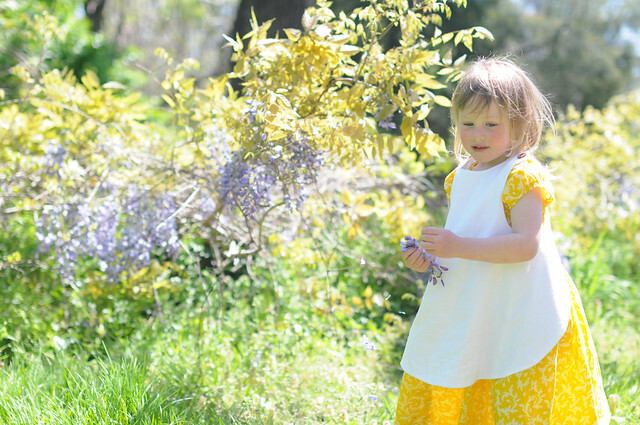 Love the vibrant yellow you chose- its looks beautiful on the girls and photographed well. The pics are so pretty. Absolutely beautiful Ginny – so special. One of my most favorites pictures of my childhood is a picture of my sister and I in matching Christmas dresses my mother sewed. those dresses are beautiful! I may need to get that book and show it to my mom. She’s the sewer in the family and my 3 girls would LOVE those!